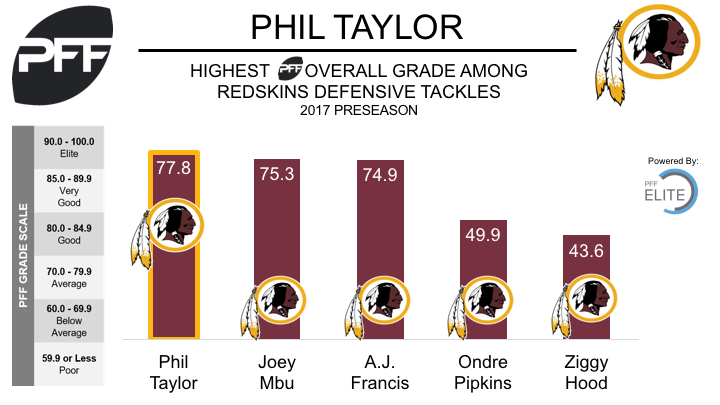 ESPN’s John Keim has reported that Washington Redskins nose tackle Phil Taylor will miss the entire 2017 season with the quad injury he suffered in the team’s third preseason game against the Cincinnati Bengals. It’s a further injury setback for the seventh-year player, who hasn’t played a regular season snap since 2014. Prior to injury, Taylor looked like he had secured the starting nose tackle position in Washington’s base defense. After three preseason games, he earned a PFF overall grade of 77.8 that bettered the grades of both A.J. Francis (74.9) and Joey Mbu (75.3), his main competitors for the position. Taylor performed especially well when asked to rush the passer, and produced three total pressures on nine pass-rush snaps, for a pass-rush productivity (the PFF metric that measures pressure on a per-snap basis with weighting toward sacks) of 27.8, the highest mark among 166 interior defensive linemen with at least 9 pass-rushing snaps.